The Hawaii Department of Agriculture (HDOA) developed the Kauai Agricultural Good Neighbor Program (Good Neighbor Program) in response to the highly charged debate in Kauai over pesticides. The Good Neighbor Program includes voluntary guidelines for outreach, pre-application notification and post application reporting, and increased buffers for restricted use pesticides (RUP). HDOA asked the Environmental Mediation Center to conduct an evaluation of the Good Neighbor Program. According to HDOA Chairman Scott Enright, “HDOA launched the Good Neighbor Program in the hopes that the additional buffers and the notification and reporting on restricted use pesticide usage would be a good first step. Now that the program has been in effect for over a year, we would like to evaluate the program and find out whether its accomplished its goals, whether it should be extended, and if so, how could it be improved. We encourage all stakeholders to participate in the evaluation.” This webpage is a resource for information about the evaluation of the Good Neighbor Program, containing background information and the final report. The Good Neighbor Program is a voluntary program. Syngenta, BASF Plant Science, Dow AgroSciences, DuPont Pioneer, and Kauai Coffee Co., LLC. are participating in the program. The evaluation included interviews and small focus group meetings with the participating companies, neighbors, and other stakeholders, and an on-line survey. The GNP anticipated that participating farm operators would meet with their neighbors to discuss the farm’s use of RUPs and any questions or concerns the neighbors had. The evaluation investigated the frequency of the dialogues and the level of satisfaction from those who participated in the dialogues. 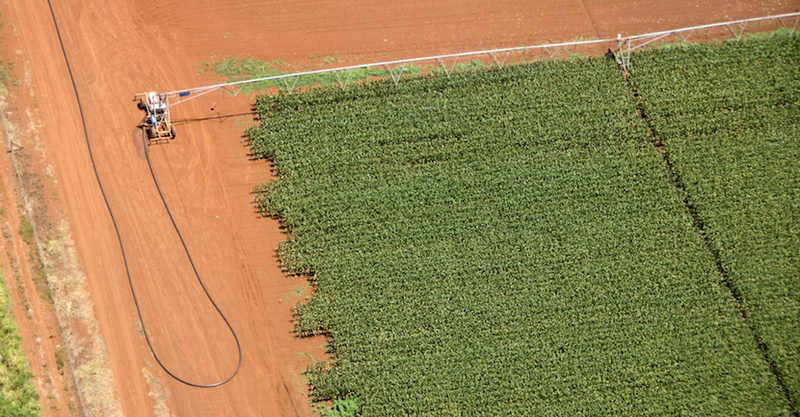 Under the notification process of the Good Neighbor Program, participating farm operators who utilize RUPs provide pre-application notice to certain entities that registered to receive information from a particular farm. The evaluation investigated how many people registered and the level of satisfaction with the information provided in the pre-application notification. Participating farm operators also provide monthly post-application reports to a HDOA database that lists all applications of RUPs including the product, the amount, and the acreage applied. The evaluation investigated the frequency of visitation to the database, the accessibility of the information, and the adequacy of the information provided. With a few exceptions, the Good Neighbor Program establishes a voluntary minimum buffer of 100 feet between the application of a RUP and the property line of schools, medical facilities, and residences. Any existing stricter regulation supersedes the Good Neighbor Program buffer. The evaluation investigated any compliance issues, complaints, and stakeholders’ satisfaction with the adequacy of the buffer. Matt Strassberg is the director of the Environmental Mediation Center and the administrator of the Hawaii Agricultural Mediation Program as well as agricultural mediation programs in other states. He is an attorney and mediator with over twenty five years of experience in environmental law and mediation. He serves on the Steering Committee of the Coalition of Agricultural Mediation Programs, and is listed on the roster of the US Institute for Environmental Conflict Resolution. Kem Lowry is an Emeritus Professor of Urban and Regional Planning at the University of Hawaii. He has researched and served as consultant to public agencies, non-profit organizations on land use and environmental policy including agricultural issues. He is also a mediator, facilitator, and has conducted numerous program evaluations internationally. 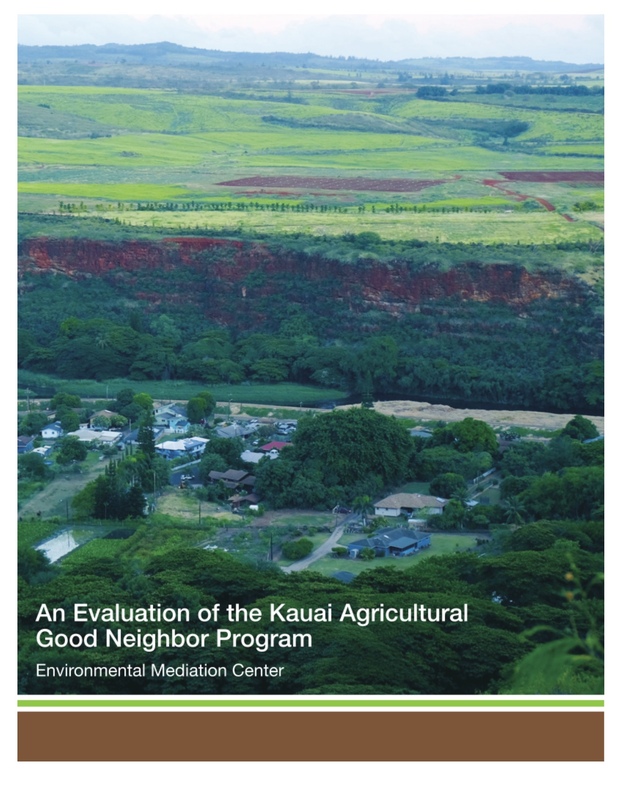 Final Report on the Kauai Agricultural Good Neighbor Program This report summarizes findings of a formative evaluation of the Good Neighbor Program (GNP) conducted by the Environmental Mediation Center in the fall of 2015. The GNP has been well received by both the participating companies and the surrounding communities. The GNP served as a catalyst for the participating companies to conduct a comprehensive outreach campaign and meet with the surrounding communities. The GNP did not pose an undue administrative problem and all the companies are willing to continue participating in the program.